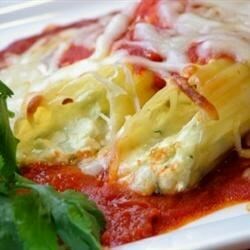 "I have used this basic principle and adapted it to make stuffed shells and lasagna. If making lasagna, I buy a second, smaller jar of spaghetti sauce. I always feel like I need a bit more. Merry Manicotti!" In a medium bowl, mix together ricotta cheese and eggs until blended. Stir in spinach, mozzarella cheese, 1/4 cup of the Parmesan cheese, sugar, salt and pepper. Stuff mixture into uncooked pasta shells. Spread 1/2 cup spaghetti sauce in the bottom of a medium baking dish. Arrange stuffed pasta shells in a single layer over the sauce. Pour the remainder of the sauce over the shells, cover dish, and chill in the refrigerator for 8 hours, or overnight. Preheat oven to 400 degrees F (200 degrees C). Bake covered for 40 minutes. Sprinkle with remaining Parmesan cheese, and bake for another 15 minutes. Very simple and very tasty! I recommend putting the filling mixture in a large ziplock bag and cutting a corner off so you have a "pastry bag" type thing to pipe the filling in. Average. Sugar made it too sweet and I would cut back a little on the spinach. Use plenty of sauce as it tends to be dry.